Polybius is a fictitious arcade game, the subject of an urban legend that supposedly first emerged in early 1981. It has served as inspiration for several free and commercial games by the same name. The original game allegedly was part of a government-run psychology experiment based in Portland, Oregon. Gameplay supposedly produced intense psychoactive and addictive effects in the player. These few publicly staged arcade machines were said to have been visited periodically by men in black for the purpose of data-mining the machines and analyzing these effects. Eventually, all of these Polybius arcade machines allegedly disappeared from the arcade market. Polybius is also the name of the Greek historian, Polybius, who was known for his assertion that historians should never report what they cannot verify through interviews with witnesses. An entry for the title was added to arcade game resource coinop.org on February 6, 2000. [note 1] The entry mentions the name Polybius and a copyright date of 1981, although no such copyright has ever been registered. The author of the entry claims in the description to be in possession of a ROM image of the game, and to have extracted fragments of text from it, including "1981 Sinneslöschen". The remainder of the information about the game is listed as "unknown", and its "About the game" section describes the "bizarre rumors" that make up the legend. The story tells of an unheard-of new arcade game appearing in several suburbs of Portland, Oregon in 1981, something of a rarity at the time. The game is described as proving popular to the point of addiction, with lines forming around the machines often resulting in fighting over who would play next. The urban legend describes how the machines were visited by men in black, who collected unknown data from the machines, allegedly testing responses to the game's psychoactive effects. Players supposedly suffered from a series of unpleasant side effects, including amnesia, insomnia, night terrors and hallucinations. Approximately one month after its supposed release in 1981, Polybius is said to have disappeared without a trace. The company named in most accounts of the game is Sinneslöschen. The word is described by writer Brian Dunning as "not-quite-idiomatic German" meaning "sense delete" or "sensory deprivation". These meanings are derived from Sinne, "senses" and löschen, "to extinguish" or "to delete". Some time prior to September 2003, Kurt Koller, the owner of coinop.org, submitted a tip-off to the video game magazine GamePro about Polybius. Polybius then appeared in the September 2003 issue of GamePro, as part of a feature story on video games called "Secrets and Lies." This was noteworthy, as it was the first known printed mention of the game, exposing the legend to a mass-market audience. The article declared the existence of the game to be "inconclusive,"  helping to both spark curiosity and spread the story. Following the appearance in GamePro magazine, a number of individuals came forward claiming to have some involvement with Polybius. In 2006, a man named Steven Roach claimed he had been one of the original programmers and that his company developed a game with very intense and cutting-edge graphics. However, according to Roach, a boy experienced an epileptic seizure while playing, and the cabinets were withdrawn by the company in a panic. Although Roach offered no proof for his claims, his story added details on the gameplay, which later inspired Rogue Synapse's game based on the legend. 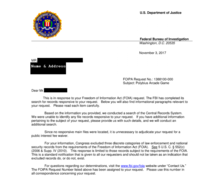 E-FOIA request for Polybius, which came back with no results. The original game's existence has never been authoritatively proven. Snopes.com claims to have debunked the existence of the game as a modern-day version of 1980s rumors of "men in black" visiting arcades and taking down the names of high scorers at arcade games. This led to the hypothesis that the government was hosting some sort of experiment and sending subliminal messages to the players. Magazines of the time period dedicated to electronic gaming make no mention of a Polybius, and mainstream news also fails to note such a game. While a number of mockup cabinets and games inspired by the myth do exist, no authentic cabinets or ROM dumps have ever been located. Ben Silverman of Yahoo! Games remarked: "Unfortunately, there is no evidence that the game ever existed, no less turned its users into babbling lunatics ... Still, Polybius has enjoyed cult-like status as a throwback to a more technologically paranoid era." Skeptics and researchers have differing ideas on how and why the story of Polybius came about. American producer and author Brian Dunning believes Polybius to be an urban legend that grew out of a mixture of influences in the 1980s. He notes that two players fell ill in Portland on the same day in 1981, one collapsing with a migraine headache after playing Tempest, and another suffering from stomach pain after playing Asteroids for 28 hours in a filmed attempt to break a world record at the same arcade. Dunning records that the Federal Bureau of Investigation raided several video arcades in the area just ten days later, where the owners were suspected of using the machines for gambling, and the lead-up to the raid involved FBI agents monitoring arcade cabinets for signs of tampering and recording high scores. Dunning suggests that these two events were combined in an urban legend about government-monitored arcade machines making players ill. He believes that such a myth must have been established by 1984, and that it influenced the plot of the film The Last Starfighter, in which a teenager is recruited by aliens who monitored him playing a covertly-developed arcade game. Dunning considers "Sinneslöschen" to be the kind of name that a non-German speaker would generate if they tried to create a compound word using an English-to-German dictionary. The game Cube Quest, released in arcades in 1983, is a shooting game with surreal visuals which played from a laserdisc; as such its visuals were far ahead of typical games of the time, and it would be frequently visited for maintenance (because of frequent breakdowns of laserdisc players in arcade games) and often removed from arcades after a short time for the same reason. Many commentators believe that players claiming to remember having played or seen Polybius may actually be recalling Cube Quest. However, some skeptics believe that the Polybius myth has a far more recent origin. British filmmaker and video game journalist Stuart Brown, after his investigation of the legend's origin, did not find any evidence of the Polybius myth existing until the year 2000. He concluded that Polybius was an intentional hoax made by Kurt Koller, owner of coinop.org, in order to drive traffic to his website. The hoax capitalized on the popularity of conspiracy theories and the highly viral nature of other recent Internet hoaxes. In Brown's view, the reasons for a 1980s origin are simply retroactive justifications of the hoax's existence which served as inspiration to Koller to craft his tale. He also theorized that people remembering seeing something about it on Usenet in 1994 were misremembering articles on Publius Enigma. Brown also noticed striking similarities between the logo of Polybius, provided by the image on coinop.org in 2000, and other arcade video games such as Bubbles and Robotron: 2084. He concluded that the bottom text is similar to that of Robotron: 2084, and the font in which the logo is made in is almost identical to that of Bubbles, with only the O different and the H flipped. He later stated that this could be a copycat fan of Williams Electronics as both Bubbles and Robotron: 2084 were made by them and that both were released a year later than when Polybius was said to first appear. Though the original has never been authoritatively located, several video games have been published using the name Polybius, drawing upon the urban legend as inspiration. The claims made in the urban legend of psychoactive or subliminal effects do not apply to these games. In 2007, PC freeware developers and arcade constructors Rogue Synapse registered the domain sinnesloschen.com and offered a free downloadable game titled Polybius for PC. The game's design is partly based on a contested description of the Polybius arcade machine posted on a forum by an individual named Steven Roach who had claimed to have worked on the original. Rogue Synapse's Polybius is a 2D shooter resembling Star Castle with extremely intense graphical effects. It also exactly duplicates the distinctive title screen and font referred to in the urban legend, and is compatible with PCs mounted inside arcade cabinets. As a result, fans were able to create "playable Polybius arcade machines" using this version, which fueled the popularity of the urban legend. Most people claiming to have found the "lost Polybius arcade machine" are referring to this game. To complete the illusion, Rogue Synapse's owner Dr. Estil Vance founded a Texas-based corporation bearing the name Sinnesloschen (without accents) in 2007. He transferred to it the "Rogue Synapse" trademark and a newly registered trademark on "Polybius". The author does not make any claim that his version of Polybius is the authentic original, stating clearly on its page that it is an "attempt to recreate the Polybius game as it might have existed in 1981". Chris Trimiew, owner of Lost Classics, is the author of a homebrew Atari 2600 game named Polybius. Gameplay is not claimed to be based on the original game, and the author expressed doubt that the Atari 2600 hardware would be able to emulate anything close to the claimed original arcade game. It is a simple crosshair-based shooting game resembling Star Raiders, except that occasionally the screen flashes subliminal messages such as "DEATH", "PAIN", and "SUFFER". He marketed the game on October 5, 2013 at the Portland Retro Gaming Expo, as a limited run of 30 cartridges. In 2016, Llamasoft announced a game called Polybius for the PlayStation 4 with support for the PlayStation VR. Polybius was added on the PlayStation store on Tuesday, May 9, 2017. In early marketing, co-author Jeff Minter claimed to have been permitted to play the original Polybius arcade machine in a warehouse in Basingstoke, England. He later acknowledged that the game was inspired by the urban legend, but does not attempt to reproduce its alleged gameplay. Polybius machines have appeared in the background of arcade scenes on television shows and in other media. In the 2006 episode of The Simpsons, titled "Please Homer, Don't Hammer 'Em", a Polybius cabinet appears in an arcade full of outdated arcade machines from the 1970s and 1980s, bearing a single button and printed with the words "property of US Government". The game also appears in the background of two episodes of the 2014 television show The Goldbergs and a poster advertising the game is present in the local theater, in the comic Batman Inc. No. 1 (2012), on a T-shirt in Vertigo's 2008 House of Mystery series, and as the central theme in the fourth episode of season one of the sci-fi series Dimension 404 (2017). A Polybius arcade cabinet (with an Out of Order sign) can be seen in the background of a video arcade in the 2018 Canadian horror mystery film Summer of 84, which subsequently takes place (1984) in a small Oregon town. The Polybius legend is an integral part of the plot[clarification needed] of Doomsday Arcade, a video series hosted by Escapist. It is also used as part of the plot setup in Armada: A Novel by Ernest Cline. The creation and promulgation of the Polybius myth were explored in the Radiotopia podcast The Polybius Conspiracy, which originally aired in 2017. The story blends facts from the period with fictional characters and storylines. The music video for the song "Less Than", by Nine Inch Nails, features the aforementioned Llamasoft Polybius videogame. The game was the subject of episodes of Game Theory in 2012 and was the focus of a Halloween-themed episode of Angry Video Game Nerd in 2017. It will also be the subject of a feature film by YouTuber Stuart Ashen, labelled "Ashens and the Polybius Heist", to be released in 2019. An arcade machine of the game can be seen in season 4, episode 29 of the cartoon series Bravest Warriors. ^ Although Coinop lists the page as originating in 1998, it appears to have defaulted to that time without any known creation time existing in the database. ^ a b c d e f g h i j k l m Brian, Dunning (May 14, 2013). "Skeptoid #362: Polybius: Video Game of Death". Skeptoid. Retrieved October 13, 2014. ^ a b c d e f g h i Brown, Stuart (September 8, 2017). "POLYBIUS - The Video Game That Doesn't Exist". YouTube. Retrieved September 8, 2017. ^ a b c coinop.org. "Polybius at The Clickto Network". Clickto. Archived from the original on March 3, 2000. Retrieved October 13, 2014. ^ "Search Request: polybius". United States Copyright Office. Archived from the original on May 8, 2017. Retrieved May 8, 2017. ^ a b Silverman, Ben (January 25, 2008). "Video Game Myths: Fact or Fiction? – Video Game Feature". Yahoo! Video Games. p. 2. Archived from the original on January 29, 2008. ^ "Polybius Entry at coinop.org". September 28, 2014. ^ Elektro, Dan. "Secrets & Lies (page 2) Feature". GamePro.com. Archived from the original on December 2, 2008. Retrieved December 2, 2008. ^ "Urban Legends Reference Pages: Hoax Round-Up". Snopes.com. November 29, 2007. ^ Good, Owen S. (June 17, 2017). "Was Polybius real?". Polygon. Retrieved November 5, 2017. ^ "Tummy derails asteroids champ". The Register-Guard. Nov 29, 1981. Retrieved October 13, 2014 – via Google News Archive Search. ^ Kellogg, Patrick. "Polybius by Patrick Kellogg". Retrieved August 21, 2018. ^ "Serious Game Classification : Polybius (1981)". Retrieved May 14, 2017. ^ "Taxable Entity Search". Comptroller.Texas.Gov. Retrieved March 14, 2019. ^ "ROGUE SYNAPSE Trademark of VANCE, ESTIL - Registration Number 3052170 - Serial Number 76564186". Justia Trademarks. Retrieved March 14, 2019. ^ "Search trademark database". United States Patent and Trademark Office. Retrieved March 14, 2019. ^ "What is Your Pleasure Sir". SINNESLOSCHEN. Retrieved June 1, 2017. ^ Lost Classics (December 3, 2013). "Polybius Atari 2600". YouTube. Retrieved June 1, 2017. ^ Cottell, Pete (October 20, 2013). "Pac From the Grave: 128 bytes and 35 years later, people are still making new games for the Atari 2600". Willamette Week. Retrieved March 14, 2019. ^ Machkovech, Sam (October 8, 2016). "A video game called Polybius is actually coming out. Will it kill you?". Ars Technica. Retrieved June 1, 2017. ^ "Polybius on PS4". Official PlayStation Store US. May 9, 2017. Retrieved May 10, 2017. ^ Minter, Jeff (October 7, 2016). "Sample the ludic psychedelia of Polybius". PlayStation.Blog.Europe. Retrieved March 14, 2019. ^ "Polybius: Early Days". The Grunting Ox. Llamasoft. Retrieved March 14, 2019. ^ "Episode One – Doomsday Arcade Video Gallery – The Escapist". The Escapist. Retrieved October 13, 2014. ^ "8 Reasons Ernest Cline's Armada Is Nothing Like Ready Player One (and Why That's Not a Bad Thing) – The Robot's Voice". therobotsvoice.com. July 24, 2015. ^ "The Polybius Conspiracy". Radiotopia. Retrieved 2018-02-03. ^ Nine Inch Nails. "Nine Inch Nails – LESS THAN" – via YouTube. ^ The Game Theorists. "Game Theory: Polybius, MK Ultra, and the CIA's Brainwashing Arcade Game" – via YouTube. ^ Cinemassacre. "Polybius - Angry Video Game Nerd (Episode 150)" – via YouTube. ^ "Ashens and the Polybius Heist". Indiegogo. Retrieved 2018-07-27.